Today I'm launching a new section of the blog called She Really Had A Baby Too. Highlighting mothers on the site is nothing new but this section, in particular, will give mothers who run their own blogs the chance to take over with a post for the day giving insight about what they write about and what their experiences are. I personally enjoy todays blog, Who Said I Have To Stay Home - you will too, so check her out! Also, if you know of a mom that would like to take over or you're mom interested in doing so send an e-mail to jessicarose@shereallyhadababy.com . Of course, make sure you are subscribed to the blog. 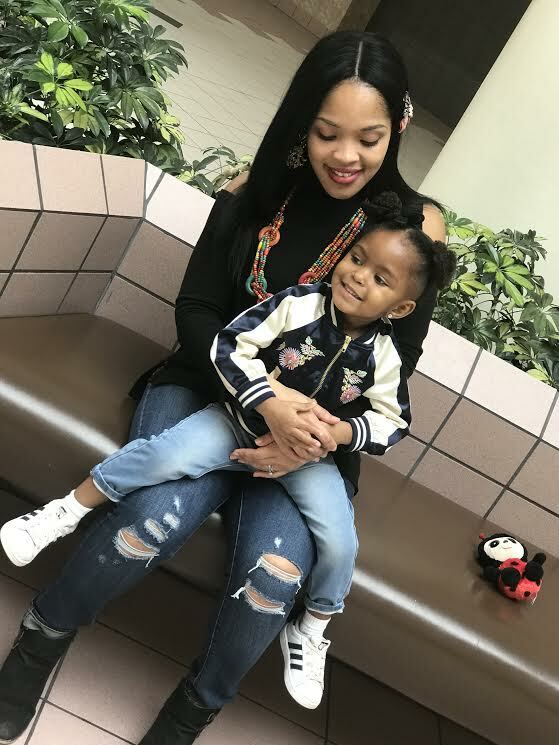 I’m a “youngish” first-time mommy and wife, working full time in project management, and attending school part time trying to finish up an MBA program. I work out sometimes, travel when the budget allows, and play piano here and there. Despite my responsibilities, I decided to start a blog too. So yeah, I’m quite busy, but I LOVE it…mostly. I decided to blog about all of this business because mothers having pursuits outside of the home is often shunned by society- men and women included. I titled my blog WhoSaidIHaveToStayHome.Com because it is geared towards defending and supporting career-oriented mothers who have goals outside of the home. My blog is centered on motherhood, professional life, fitness, and travel. Of everything, motherhood and family are most important to me, but I’ve been blessed to not have to abandon the other three. My life is a balancing act, which although I’m getting better with, I struggle with from time to time. I enjoy having my blog as a space to laugh and discuss life with other women who are in similar boats or even being an inspiration to those who want to have children but are afraid they’ll have to put their lives on hold. You don’t have to girl, but you will need loads of support, time-management skills (ha), and a great deal of passion. There will be obstacles along the way, and sometimes “quitting” seems more appealing than success. Don’t quit - that’s what Who Said I Have To Stay Home embodies. Without getting too deep into my business, I like to refer to my daughter as an unexpected blessing. Although nervous, I accepted my challenge as many young women do. Gone were my days of reckless spending, and partying all weekend. I am no longer the girl I was in 2014. I had to make a life decision, and subsequently, I became much more intentional with my actions and activities. Having my daughter forced me to get focused. I stopped saying what I wanted to do and did it. Time waits for nobody, and that becomes even clearer when one day your child is cooing and trying to suckle a bottle, and the next they’re walking around, trying to take food out of your hands. Life moves quickly, so it made me stop waiting for opportunities, and start actively pursuing them. Up until motherhood, I had done “all the right things.” I had gone to college, was working full-time, and making OK money for a single girl. Good money for me at the time was being able to cover the check if I went out to dinner with a friend - Applebees, water only, please. At the time, 24, naïve, and newly pregnant, I didn’t fully grasp what he was saying. Why would having a child make me more confident? Why would I speak up more? Fast forward to me becoming a mother….not only did my voice become louder, but I started speaking up to people I never thought I would. I promised my husband I wouldn’t speak too much about our marriage on the internet, so I’ll make it short and sweet. My husband and I weren’t married when we conceived. Bella was front-row and center at our nuptials. She had lots of wedding cake that day. The End. We were at least engaged- nobody cares though.. unnamed people had no problem preaching their disdain of what was going on. Me conceiving unwed, us living together, me waiting a long time after her birth to get married...it never stopped. · No, I will not participate in a shotgun wedding. I want a flat tummy on my wedding day- even though it’s never been flat and never will be, ya’ll not rushin' me. · I’m not going to marry him just because we had a child together. I know your church disagrees and that’s alright. Your church also won’t agree if we end up getting a divorce a year later because we rushed into a decision. A year after having my daughter, money wasn’t as green anymore. It was grey, worn, and there wasn’t enough of it. I wasn’t raised by people who lived check-to-check, and I promised myself I wouldn’t raise my daughter that way either. Speaking up came in handy now because I started asking for raises. I stopped talking about going back to school and actually started applying. Then I enrolled in an MBA program. When I saw there was no more money or opportunity for me at my job, I found a new one. When my new job offered me a position, I told them I deserved more. Confidence and speaking up is now a big part of who I am. I can’t be a mother and be timid. It’s not fair to my child. How can I represent her, if I can’t represent myself? Yes, I still pray to the God that they told me didn’t approve of my sins. He knows my heart. Don’t worry, I’m not going to start preaching. I pray for peace and understanding. I pray for strength, the health of my family and loved ones. I am thankful for all of my blessings and speak it daily. Writing. Pursuing a dream. Releasing emotions and sharing my feeling in an effort to help myself, and maybe someone else. I finally stopped second-guessing myself and launched my blog. This is all a part of me speaking up, and getting results. The feedback I’ve received only pushes me to keep going. Why was I scared that people wouldn’t like my writing? Who told me that my thoughts and feelings wouldn’t merit readership? Who Said I Have To Stay Home?! If my daughter ever tells me she wants to do something, I want to be able to say “go for it,” off of the strength that I know first-hand all dreams are attainable. I’m still very far from where I’d like to be. I don’t hold the job title that I’d like to have. I’m still disorganized as they come, and I struggle to meet deadlines. For instance, I told Jess I’d have this post to her a week ago! Ha! Still working on my MBA- 1.5 years down, 1 more to go. My thighs still need toning, and I only have 30 subscribers on my blog. However, I’m much closer to my goals than I imagine I would have been if not for having a catalyst in my life to get me started. There’s nothing quite as life-changing as new life. It can bring out both the best and worst in people. Some of us are motivated to soar higher, and some of us crack under pressure. Don’t let your baby crack you, let your baby motivate you. Speak up no matter what you’re doing, staying home or not." You can find Angela on instagram @angiebellzn or at any of the links above to check out her blog!